With our ready-made treasure hunt you can organise an amazing treasure hunt in minutes! In this treasure hunt you find 30 clue cards, you choose how many and which ones you want to use. This way you can adjust the duration of the scavenger hunt, the severity according to the children's age as well as where it is kept. This treasure hunt is mainly for inside, but there are also some clues that leads outside, that can be included if you wish. In this treasure hunt you will find 30 clue cards - you choose how many and which ones you want to use. This way you can adjust the duration of the game, the level of difficulty according to age as well as where to set it up. This treasure hunt is mainly for inside use however there are some clues that lead outside, that can be included if you wish. You can arrange this treasure hunt for one child or a group of children. It is really fun to do it together with friends and work together to figure out all the clues. The clues are descriptions, pictures, riddles and rhymes. An adult is needed to help the younger children read but older children can read the short clues themselves. 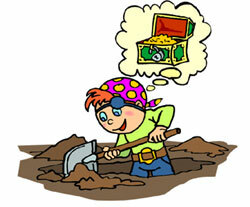 This treasure hunt is suitable and fun for all children from about 3 years old up to 10. Use the treasure hunt to find goodie bags at a kids' party, do an egg hunt at Easter, or to keep the kids occupied when the grown-ups at the party have not yet finished eating or talking. The treasure hunt includes a lot of clue cards, so you probably won't use them all. Save them, change them around and use them again - in another place! Once you have ordered and paid, the product is delivered instantly to your inbox. The preparations take only a few minutes and then you'll have an exciting activity for the children all ready to go!